I love being a SAHM! The pizza shown above was made with homemade from scratch tomato sauce, and homemade from scratch pizza dough (another blogger was good enough to link to a recipe she’d found – the texture was good, but the dough was a little bland so I think if I make it again I’ll up the salt slightly and add a teaspoon of sugar to have a bit more flavor). It was then LOADED with fresh Mozzarella, pepperoni, and black olives. In college, I spent a semester abroad in Ecuador and studied at La Universidad San Fransisco. I lived with a host family in the mountains of Quito for five months, and thorougly enjoyed my travels and endless opportunities to speak Spanish. My time there left me enamored with a few food items I hadn’t been as heavily exposed to back home, including sparkling water, fried green plaintains, passion fruit, and avocados. I learned in Ecuador that avocados are a splendid addition to just about everything. Eggs? Better with avocado. Steak? Goes great with avocado. Potato soup? Add an avocado! Who knew? 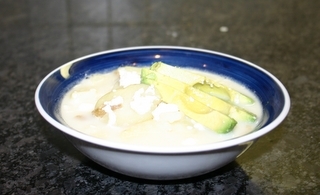 Last week, I ate some summer rolls for lunch that included avocado, and as I savored the cool creamy texture and unique flavor I found myself remembering many meals eaten in Quito, and suddenly craving locro de papas, a potato soup traditionally served with avocado. So, I decided to try my hand at cooking it myself. I brought 8 cups of lightly salted water to a boil in a large pot, and added roughly 3 lbs of sliced potatoes. 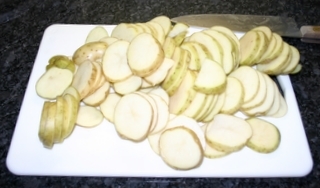 One of the recipes said to dice the potatoes – but I seem to remember them being sliced so that’s what I did. As a side note, I didn’t even think to peel the potatoes because I usually eat them w/ the peels, but it would have been more authentic if I’d done so. Boil until the potatoes are soft. One recipe said to mash some of the potatoes into the broth, the other didn’t. I did so because I remembered a slightly thick base. 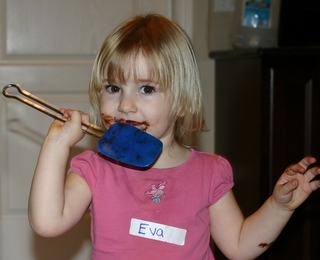 If I make this again, I will first drain some of the water b/c there was a bit too much liquid. Add milk, and cheese. A note on the queso fresco – what they sell in the U.S. doesn’t taste like what I ate in Ecuador (and for that matter, the cheddar the sell in Ecuador tastes like rubber – I think we all just make our cheese different from each other). When I first got back, I tried a couple of brands they sold in my supermarket but was disappointed each time. Now, six years later, my memory isn’t quite as sharp, which was to my benefit. 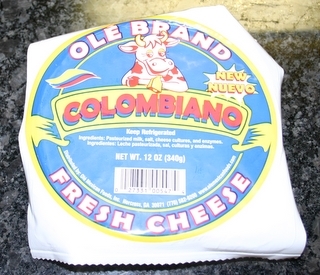 I bought this brand based solely on the fact that Columbia is closer to Ecuador than Mexico is (where most of the queso fresco in my supermarket comes from) and on the hope that it would be more similar. I’m not even positive. What I ate straight from the package tasted drier and blander than what I remember eating… but in the soup is worked just fine. I added salt, pepper, and garlic powder to taste (I would have used fresh garlic but we were out). I brought the soup back up to a boil, reduced to a simmer, and gave it a few minutes to try to cook it down (like I said – a bit too liquidy at first). Then I ladelled into a bowl and garnished with more cheese and a generous helping of fresh sliced avocado. Delicious!